On a brisk Sunday afternoon, I got off the bus and headed toward the Minneapolis Central Library to meet some Internet strangers from Free Code Camp Twin Cities, a local community for people who are learning code on the website Free Code Camp. The site is exactly what it sounds like: a place to learn to code for free. It’s similar to Codecademy in general format but much more employment oriented, and thus much more oriented toward networking and community. From the outset, it connects you to the greater online community and, through Facebook, to one’s local community. 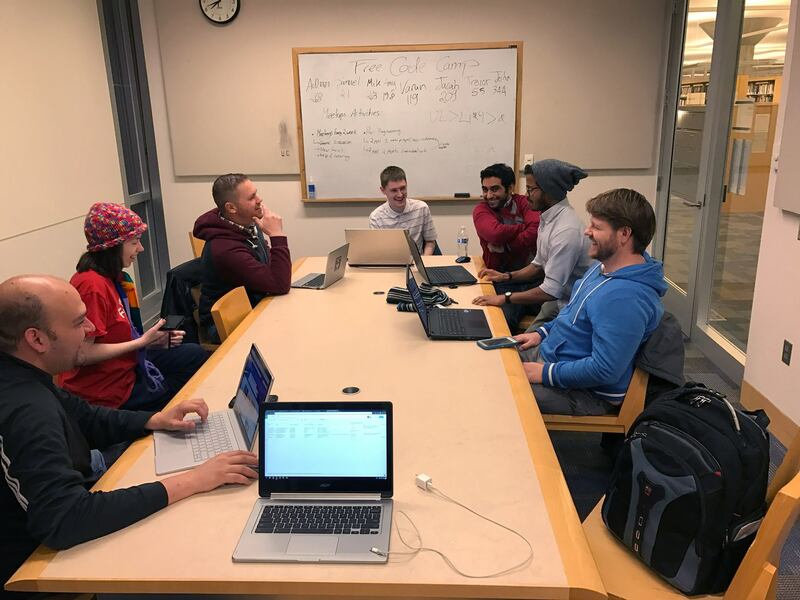 In Free Code Camp Twin Cities, I was connected to a local group of like-minded geeks, some of whom were experienced developers, but most of whom were novices like me. Upon meeting the group, I was surprised by how friendly they were to such beginners. Although I am interested in coding, as a newcomer, most of the industry jargon is Greek to me. The group members, however, were happy to answer my odd questions. On several occasions I found myself opening a word processor on my laptop to take notes, as the group gave very good advice on employment. It was worth the cold bus trip. The only critique that I would have for the small group is that I was the only she-pronoun-using person there, though, I doubt that the lack of women and feminine nonbinary folks is the group’s fault; more likely it’s a symptom of the greater systemic problem of STEM careers not being seen as a “feminine” professions. Communities like Free Code Camp are spread through word of mouth, and when the media’s image of a programmer is predominantly masculine, it affects what audiences the group is shared with and who thinks the work of joining is worth the effort. I worry that this group could easily end up in the vicious cycle that other STEM communities get swept up in: that because there are no feminine people in the group, feminine people do not join the group. I hope in part that this article will spread the word to like-minded feminine geeks. Currently, we are in the process of developing a website to test our coding chops. Most of us have made some progress through the lessons on Free Code Camp and are looking to get some real world experience. If you would like to join us, you can find us at the Free Code Camp Twin Cities Facebook group. This is super cool. I love the employment based focus, I’ve doodled around with Python and CodeAcademy before, but this is the first coding related thing that’s really drawn me in for a while. Thanks for the post!